…..the carrying on by the organisation of any construction or maintenance operations,.. This entry was posted in Anti Social Behaviour, Crime etc, Bad Gyrations KX Campaign, Road Safety in Kings Cross, Transport. Bookmark the permalink. 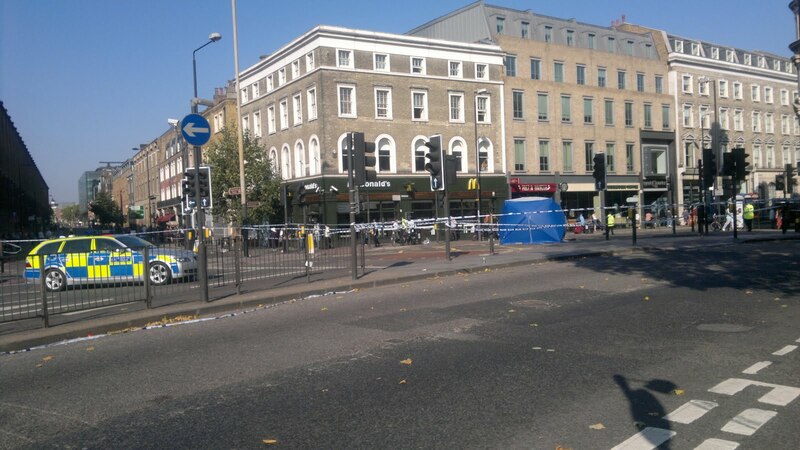 29 Responses to Kings Cross cyclist and pedestrian deaths and injuries – corporate manslaughter by TfL? Well put and one of the best uses of a FOI request I’ve seen. I have tweeted it to some CSM accounts to encourage them to read it. I think it will add a lot of weight to something that is already gaining momentum – ie the Blackfriars protest, plus a supposedly pro-cycling mayor with an election coming up. William, this is article literally makes my blood boil! Well done for being on the case. With regards to legal advice, may I suggest you contact RoadPeace? They are the national road victim’s charity but do excellent work on road danger reduction and are very well versed in the lorry / cyclist issue and I suspect would be very interested in hearing your thoughts. This is absolutely staggering! I have recently spent some time filing at this junction and it surely must be one of the worst if London if not the UK. I would hope that the complete removal of the gyratory system is the outcome that is sought. But the fact that they couldn’t even paint lines is shocking. Fantastic article! If you want legal advice, you may want to get in touch with The Cycling Silk ( http://thecyclingsilk.blogspot.com/ ). Have long thought that those who own/manage roads (local authorities & TFL) should be held responsible for road death in the same way as companies are held responsible for any injuries on their premises by H&S law. Basically, if the council/TfL permit motor vehicle operators to drive in areas where pedestrians or cyclists are present, at speeds likely to result in injury, and if somebody is injured as a result, that person should be able to sue for damages – not just the individual driver (as they currently can & do), but the authority who told them it was ok to be driving at that speed in the first place. In the event of death or serious injury, the authority should be prosecuted. Most employers are quite rightly sh*t scared of the consequences of staff hurting themselves, and so take their duty of care very seriously.. if only the same could be said for councils and TfL. I think the lawyers for Min Joo Lee’s family and the families of all the other people killed or injured on the streets of Kings X need to see this. This represents a massive failure in the duty of care TfL and the Mayor of London to the citizens of London. I would contribute money to launch a class action suit on their behalf as well as on behalf of the as yet uninjured users of the roads and crossings in this area. I am currently a CSM student and London Cyclist. I think there would be widespread support for any kind of demonstrations from CSM students. I can offer access to the student body to raise awareness innregards to this and can also attempt to work through the managerial body at CSM to see if any support is possible there. Please contact me if there is anything I can do. Last month I remarked to my girlfriend (to came to my workplace via this junction) that if we waited there long enough we would see an accident. I’m struck by how accurate and damning that report is, especially on the aggressiveness of the drivers. How tragic (and possibly preventable) that accident was. I work at the Guardian as a software developer so not sure how much help I can be but want to offer my services in any way needed. Great article and as a local please let me know if there is anything I can do to push this forwards. I cross the wretched junction at the bottom of York Way every day and it’s an accident waiting to happen. Pedestrians spilling into the road and cars running red lights so even the small amount of time given to cross the road is regularly curtailed. With CSM opening and the massive increase in pedestrians and cyclists in the area this just can’t be allowed to continue. You will have a lot of support from a great many people from all walks of life. TfL’s deadly obsession with increasing traffic speeds at all cost is deeply unpopular. good luck with your campaign / actions. I was shocked by this tragic fatality. TfL has gone extremely slowly on a new scheme for this junction which has now become exceptionally dangerous for pedestrian and cyclists. I strongly support all efforts to get TfL to implement the scheme speedily and will, with our GLA representative, press for action that will prevent further accidents. The entire road system around Kings Cross still bears the legacy of a time when decision-takers saw this dense residential neighbourhood as a high speed drive-through zone. At Islington Council we are determined to remove the gyratories around Kings Cross but TfL’s control over most of the roads has proven to be a huge obstacle. This truly awful. Even if a case of corporate manslaughter were not to be successful against TFL it would be good to proceed with it for the publicity it would generate. I would like to give some further information about further possible legal action to be taken against TFL for their ongoing improper conduct. The Mayor, Boris Johnson is the Chairman of TFL. A new campaign for charges of Corporate Manslaughter to be brought against TFL is with regards to the death of a cyclist which happened as a direct result of TFLs failure to follow the findings of a report. There are dozens of campaign groups demanding action to be taken against TFL with regards to this death. A recent report submitted to the Mayor of London showed that there are 4267 deaths every year caused by pollution related illness. That means that there are more people dying in London than if there were a terrorist attack like 7/7 every single week. I apologise for using that comparison but it is a fact that these numbers of people are dying and no one is taking any notice because it is an unseen killer. Every time a family looses someone to a pollution related illness it is not immediately obvious to them that this has been caused because the Mayor has failed to manage emissions strategies. In addition there are tens of thousands of people who have a diminished quality of life because of pollution i.e. people who have breathing difficulties and asthma. The Olympic Committee may impose a fine which would equate to a third of the revenue from the Olympics (£175 million), for London’s failure to meet emissions standards. At a recent seminar to discuss health effects of pollution in London held by Darren Johnson (Green Party) and Mike Tuffrey (Lib Dems) at City Hall it was revealed by Professor Frank Kelly of the Environmental Research Group (Kings College) that there has been no emissions reduction in London for the last 10 years. The Mayor of London has been asked questions about flawed emissions reduction strategies by Assembly members on a monthly basis for the last couple of years and also by many MPs who have written to him expressing concerns, and he has continually avoided or sidestepped the questions. He has a legal duty of care to ensure that the best strategies are implemented and to not do so is a breach of his legal requirements as Mayor. The reason that there has been no reduction in emissions is simple ; the emissions strategies that have been implemented have either been flawed in concept or have been mismanaged in their implementation. 1/ The ban on night time deliveries in London has meant that there is increased commercial traffic during the day. A vehicle creates emissions when the engine is under load i.e. accelerating. If a truck is travelling at night its emissions are reduced by a huge margin (probably 80%) because it is moving constantly. The increase in traffic during the day also increases the emissions of other vehicles, so there is a significant knock on effect. The FTA has been campaigning for off peak deliveries to no avail. It is a ridiculous situation that the Mayor/ TFL continues to implement a truck ban at night, when there is good reason to remove or modify it. It may just be a case of encouraging ‘off peak deliveries’ but in fact TFL seem to have actively obstructed this from happening. 2/ The LEZ is a failure. The acid test is that emissions levels have not reduced at all in 10 years and the EU are about to impose fines for this. The reason that it is a failure is because the approval of systems and the implementation has been completely mismanaged by TFL. The approval and test process was not conducted in a rigorous way which meant that systems that are not fit for purpose have been approved. The Dutch Government has conducted research and filed a report to the EU which shows that Selective Catalytic Reduction does not work in urban environments. (these systems have been used for the LEZ). In addition these systems can create harmful dioxins which have not been measured. There has been no regulation with regards to the implementation of the LEZ; systems have been fitted which have filters that block within a couple of weeks, the system is then removed but the vehicle is still certified as compliant for the LEZ. Operators were known to have fitted a single system on a vehicle, got it certified and then used the same system for its entire fleet. A VOSA inspector reported issues to TFL and was ignored. 3/ The London Taxi project has been completely mismanaged by TFL/PCO. Systems that did not work were approved and Eco-Powers system which did work was improperly withdrawn. TFL have not complied with their legal requirements as a Public body and this will be proven. A common sense approach of cleaning up all 20000 taxis has been proposed to TFL and completely ignored. TFL have acted improperly with regards to the approval of systems. Eco-powers approval was withdrawn following a rigged test, yet systems which were failing dramatically remained approved. Two companies systems were failing so badly they went out of business, yet there approvals still remain in place. It is widely thought that this has happened because of improper conduct of the Public Carriage Office and their involvement with the taxi cartels who were profiteering out of the emissions reduction systems. 4/The congestion zone does exactly what it says; causes congestion. Again it has not worked as there has been no reduction in emissions whatsoever. The only thing it achieves is causes more congestion around its perimeter which probably results in an increase in emissions. His improper conduct should be exposed. He should not remain in office for another year doing nothing while another 4267 people die. A constituent asks whether an action for corporate manslaughter could be brought against the Mayor of London over his failure to take sufficient action to stop preventable deaths from air pollution, or whether the Government would be liable within the Greater London area? My Air Quality Strategy sets out clear policies to address air pollution in London over the next 20 years. These will deliver considerable health benefits for Londoners and help ensure that London meets relevant EU limit values. THE FACT IS THE MAYOR HAS NOT ACTED IN ACCORDANCE WITH HIS PUBLIC FUNCTION, AND HAS NOT MADE REASONABLE DECISiONS. An organisation is guilty of an offence… only if the way in which its activities are managed or organised by its senior management is a substantial element in the breach referred to in subsection (1). This offence is indictable only and on conviction the judge may impose an unlimited fine (s. 1(6)). Section 18 states that an individual cannot be indicted for aiding, abetting, counselling or procuring the commission of this offence. William, It’s sally Williams from ITV London – I am trying to get hold of you today, Wednesday, for an interview. Please could you call our news desk and ask for me on 0207 430 4000.